This page discusses the choice of the truss tubes for the Cruxis telescope. 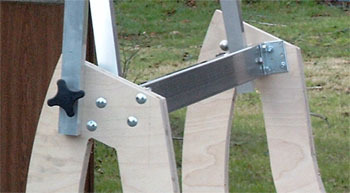 The truss tubes connect the mirror box to the upper cage. 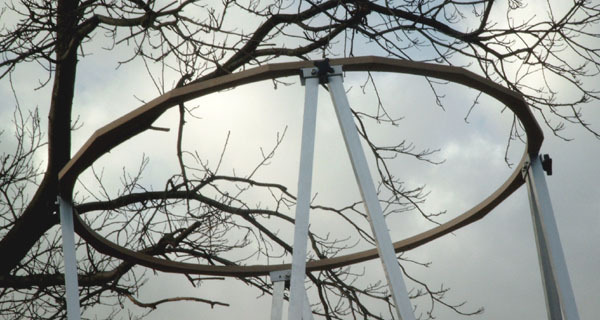 The design of the telescope calls for a truss frame with 8 tubes. Four tubes are about 3700 mm (12 ft) long and connect to the mirror box at the level of the primary mirror. The other four tubes connect to the top of the side wall and are about 3200 mm long. The stiffness of a truss frame is primarily determined by the elasticity modulus of the material and the cross-section (i.e. the weight) of the tubes. Steel and aluminum have identical elasticity to weight ratio, whereas carbon tubes will produce about 2.5 times stiffer truss poles for equal weight. Carbon tubes would significantly reduce the weight and provide excellent stiffness, but their cost is prohibitive in the diameter and length that will be required - probably more than €2000. So classical aluminum tubes will be used for a total cost of around €200. A practical limit for the tube weight is about 0.5 kg per running meter. This would give a total truss frame weight of about (4 * 3.7 m + 4 * 3.2 m) * 0.5 kg/m = 14 kg (30 lbs), or about the same weight as the upper cage. Using heavier truss tubes would mean that the tubes would mostly be carrying their own weight. 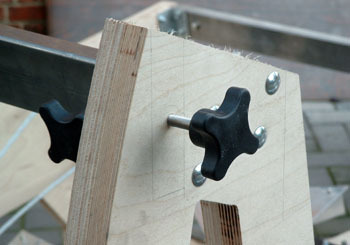 The three options will give similar performance in a truss frame. 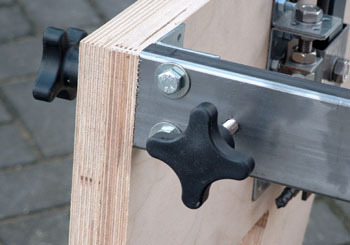 We will use the 30 mm x 1.5 mm square tubing because they're more compact and easier to mount on a flat surface. 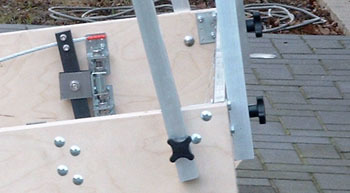 The total weight of the truss tubes will then be about 13 kg (28 lbs). 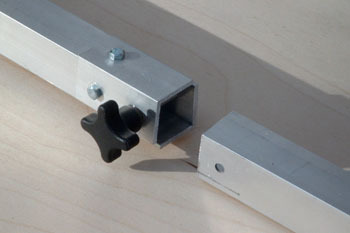 Square tubes simplify the assembly on a flat surface. On the mirror box simple stainless steel bolts with ergonomic cross knobs are sufficient to fix the tubes accurately and firmly. On the upper cage the tubes are bolted in pairs on a bracket. The tubes remain connected in pairs for easier transport and faster assembly. The truss poles have been cut in two for easier transport. 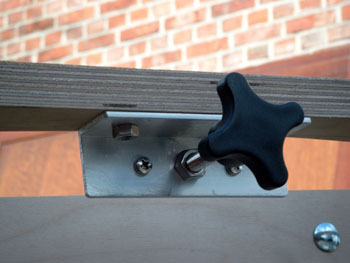 The two halves are joined by a sleeve and convenient knob. These numbers validate the statement made in the previous paragraph that the bending stiffness is quite small compared to the truss frame stiffness resulting from axial loads in the vertical triangles. The total stiffness of the frame is the sum of the two values, approx. 389 N/mm. With the design load of 20 kg or approx 195 N, the sag would amount to 0.5 mm (0.02 inch) when the telescope is pointing horizontally. That deflection is quite acceptable and should not harm collimation (the upper cage will not be rotating while sagging). Furthermore this deflection can largely be compensated by some flexibility of the mirror cell support beams, see the mirror cell page. Using a finite element model of the upper cage and the truss tubes, a more accurate computation can be made that takes into account the actual lay-out and weight distribution of the truss tubes and upper cage. Move the mouse over the image to see the deflections (magnified 100 times). 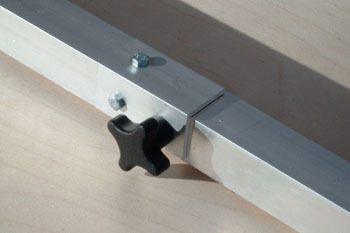 The computed sag of the upper cage amounts to 0.45 mm (0.018") which compares very well to the result of the simplified analysis above. 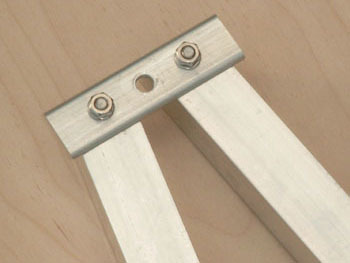 The longest truss tubes sag about 2 mm (0.08") in their middle. It's useful to verify the buckling of the tubes (consult this site for some theoretical background). In our case the tube is anchored (clamped) at both sides, so we should use a "corrected" length in this formula of 0.65 times the free length of the longest tubes or about 2200 mm. This yields a buckling load Pbuckling = 3350 N.
So there is a comfortable safety margin of about 11 with respect to the buckling load.